As Motorcycle Safety Awareness Month rolls in, we encourage all riders in central Pennsylvania to practice safe riding. In 2012, nearly 5,000 motorcyclists were killed nationwide, according to the National Highway Traffic Safety Administration (NHTSA). Pennsylvania accounted for 200 of those deaths, an overwhelmingly large number compared to just 72 in Maryland and 71 in New Jersey. One of the reasons for such a difference between states: Maryland and New Jersey require motorcycle helmet use; Pennsylvania does not. The NHTSA reports that, in states where helmet use is not required such as Pennsylvania, only 50 percent of riders choose to wear a helmet. By wearing a helmet, riders increase their chance of survival in a motorcycle accident. Riders without a helmet are 40 percent more likely to suffer a fatal head injury in a crash and are three times more likely to suffer brain injuries than those who do. Don’t buy more bike than you can handle. If it feels too heavy, it probably is. When seated, you should be able to rest both feet flat on the ground. Handles and controls should be within reach. Invest in anti-lock brakes. 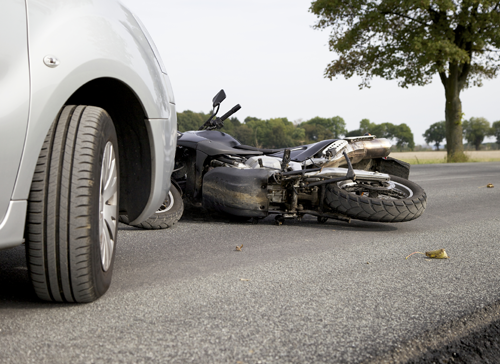 Insurance Institute for Highway Safety data shows that motorcycles equipped with ABS were 37 percent less likely to be involved in a fatal crash. Be defensive. In a recent study by University of South Florida’s Center for Urban Transportation Research, car drivers were at fault 60 percent of the time in accidents involving a motorcycle and a car. Watch for road hazards. A pothole that might hardly be noticed in a car can result in a spill on a motorcycle. If you can’t avoid the hazard, give yourself enough time and distance to slow down before encountering it. If you are involved in a motorcycle accident resulting in injury, depend on our skilled team at Katherman Briggs & Greenberg to help you through this difficult time. Contact us 24/7 for Results You Deserve®.